The reciprocating saw is a power tool that is considered to be one of the most versatile options for cutting on the market. These saws have a blade that does its work through a reciprocating or push and pull movement type. This type of saw is also sometimes called a saber saw or sawzall. Regardless of the name that you give to this powerful tool that has a history going back to the early 1950s. It’s a fantastic tool for workshops, home garages, remodeling, and professional environments. If your project needs involve making rough cuts, a reciprocating saw is the best option you have available. What makes the reciprocating saw stand out is that it can not only cut wood, but also can go through plaster, metal, fiberglass, and masonry. As long as you have the right blade available, you can saw through almost anything you can imagine. In most cases, the reciprocating saw is sold for commercial use, which is largely due to its power and efficiency in cutting. This a power tool that is used by construction workers, electricians, and plumbers on a regular basis. However, there are reasons to use this tool at home. It isn’t the right tool for the best accuracy or speed, but it is the best for versatility and reach. Today we’ll be looking at the top 10 reciprocating saws available on the market. Some are corded while others operate through battery. We’ll also consider the features that make up a fantastic sawzall and what to keep in mind while you are shopping. First, let’s take a look at the top 10 saws and their technical details. Then we’ll offer in-depth reviews for each option offered. 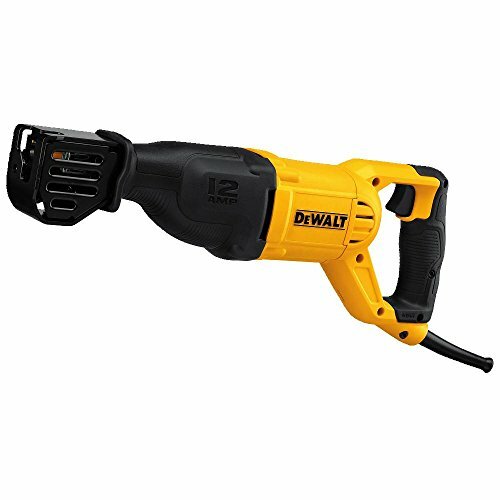 Dewalt DWE305 Reciprocating Saw Corded Electric 8.1 pounds 3 Year Limited Check on Amazon! Makita XRJ04Z LXT Reciprocating Saw Lithium-Ion Battery 8 pounds 3 Year Limited Check on Amazon! Black & Decker BDCR20C Reciprocating Saw Lithium-Ion Battery 4.5 pounds 2 Year Limited Check on Amazon! 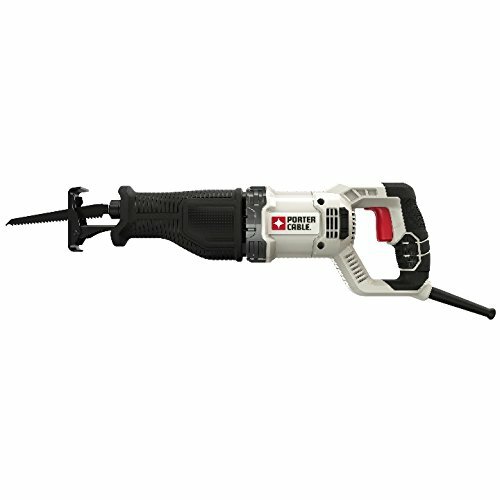 Porter Cable PCE360 Reciprocating Saw Corded Electric 6 pounds 3 Year Limited Check on Amazon! 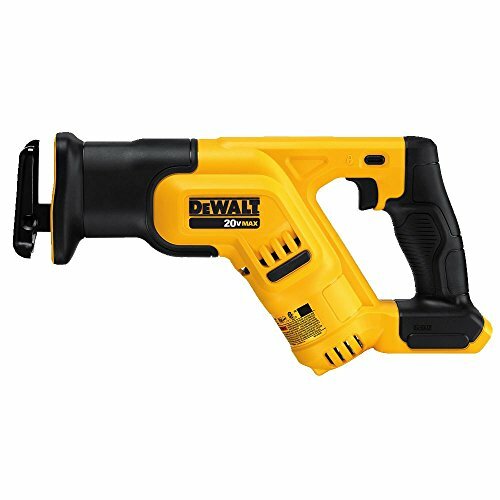 Dewalt DCS387B Compact Reciprocating Saw Lithium-Ion Battery 5.4 pounds 3 Year Limited Check on Amazon! Worx WX550L Axis 2-in-1 Reciprocating Saw and Jigsaw Lithium-Ion Battery 4.6 pounds 3 Year Limited Check on Amazon! 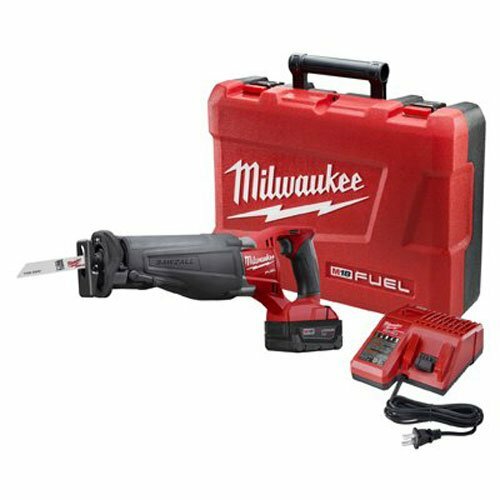 Milwaukee 2720-21 M18 Fuel Reciprocating Saw Kit Lithium-Ion Battery 13 pounds 5 Year Limited Check on Amazon! 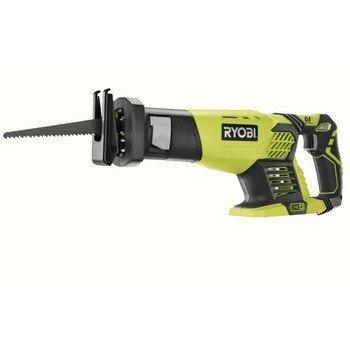 Ryobi P514 Reciprocating Saw Lithium-Ion Battery 4 pounds 3 Year Limited Check on Amazon! 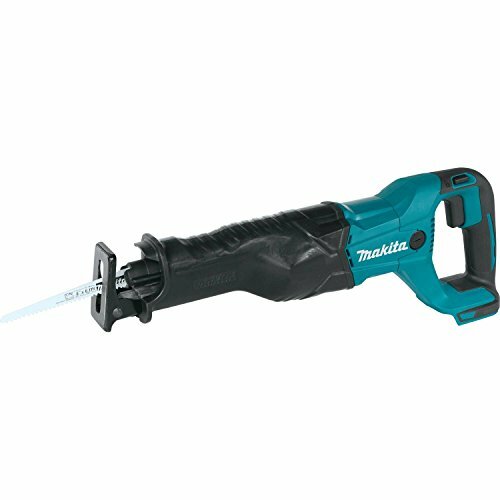 Makita JR3070CT AVT Reciprocating Saw Corded Electric 16.98 pounds 1 Year Parts & Labor Check on Amazon! 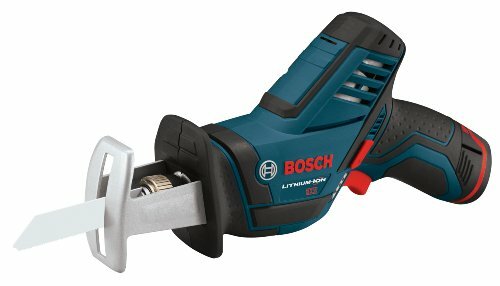 Bosch PS60-102 Max Pocket Reciprocating Saw Kit Lithium-Ion Battery 5.6 pounds 3 Year Limited Check on Amazon! The Dewalt DWE305 Reciprocating Saw comes with a one-year free service guarantee, which is only one of the things that sets it apart. This means that if your saw breaks and requires repairs for the first year, the manufacturer will take care of without a charge to you. It also has an excellent blade clamp with four positions, leading to an extremely versatile saw. This reciprocating saw also offers a lever action blade clamp, so you can change out your blades quickly and easily. This saw has a 12-amp motor and can manage up to 2900 SPM (strokes per minute). With a stroke length of 1 1/8 inches, this is one of the highest performing reciprocating saws available for purchase today. As far as being reasonable for beginners, this saw hits a lot of marks. It comes completely assembled and the lever operated blade clamp makes changing blades simple. In order to begin using this saw, all you need to do is place a blade in the clamp, plug in the power cord, and press the trigger to begin sawing for your project. The DWE305 has an all-metal body which makes it sturdy and durable. This means that you can assume the frame will last for many years. In addition to that, the other components are high-quality and should be capable of handling extended sawing time day after day. The saw has a yellow and black housing that gives it a professional and stylish look. It also features a handle that is ergonomically designed for comfort when working for long periods. When considering the features and price, this reciprocating saw gives a reasonable value for the money you spend. For an average price point, you get a 12-amp motor, variable speed trigger, three-year warranty, comfortable grip, large stroke length, and lever operated blade clamp. It would be at home in any garage, workshop, or professional environment and will last a good long time. The idea behind the XRJ04Z LXT from Makita is to provide a saw that offers efficient and lightning fast cutting. This model is also meant to provide all of the features that a woodworker would want for convenience sake. This reciprocating saw runs off of an 18-volt slide-style lithium-ion battery. It does not come with the battery, so you will be required to purchase one if you do not already own one. The good news is that if you use other Makita LXT cordless tools, they all take the exact same battery. If that is the case, you can save money using your existing batteries. This saw has a 1 ½ inch stroke length to offer the best efficiency and increases the speed you cut at. The design of the tool includes a refined crank mechanism which is fantastic at reducing vibrations and minimizing blade deflection. The LXT in the name of this tool is an abbreviation for extreme protection technology, which means that there is a massive amount of protection from water and dust. This allows the person using this reciprocating saw to do work in nearly any conditions. As far as operation of the saw goes, it’s simple enough for a beginner but has the power a professional will appreciate. It has a substantial two-finger trigger that is comfortable and in a convenient place. It also has a soft grip that will increase the user’s comfort while ensuring the lowest amount of hand fatigue. On top of that, the variable motor speed can reach a top of 2800 SPM, which is quite exceptional for the price paid for this saw. With extreme protection technology, a variable speed motor, toolless blade change, a rubberized soft grip, and an ergonomic design, this is an excellent saw for any environment. It’s a bit heavy but not overly so and is of a great size for use in a home or workshop. This particular reciprocating saw is geared towards the DIY lover or a handyman who has occasional need for powerful cuts. It offers a number of features which are appreciated by users, including variable speed for flexibility depending on the project being done. It has an average stroke length that will be adequate for most buyers except for those who do professional work on a regular basis. It also comes with toolless blade change capabilities which can cut down on downtime, and a pivoting shoe for supreme stability. It’s also extremely lightweight, portable, and compact so there’s no need to lug around a heavy machine when going off-site. This saw is powered by battery rather than needing a power outlet to do what it does best. This makes it a fantastic option for getting into narrow and tight spaces. When you have a cordless saw, that means you can do your cuts in any location and at any angle that you need to. It also allows you to bring it along with you to remote sites without having to stress about getting a generator or an extension cord. Another positive comes in the form of a level that allows you to easily swap out blades. There’s no need for a wrench or any other tools. You just use the level and switch things out and before getting right back down to work. On this model, the lever is conveniently located near the blade mount. It also automatically locks in the new blade once it is in the reciprocating saw. Unlike other saws you will see on the market with longer stroke lengths, the BDCR20C has a smaller length at 7/8 inches. This can be useful if you plan to cut thinner materials or do not want to accidentally cut too far into a material. It’s also great when there are other parts nearby that cannot be moved but would be damaged by a longer stroke length. Porter Cable is one of the big brands out there and this reciprocating saw packs a real punch. It features a 7.5-amp motor to provide quick and efficient cutting of wood, metal, and everything in between. It also has variable speed settings, so your cutting options are amplified, and you can be sure to have the right power for each project and its needs. The reciprocating saw has a toolless blade change system, so you can easily swap between blades depending on what you need to do next. The PCE360 has a pivot shoe which provides the ultimate maneuverability around materials while cutting. There is also the option for shoe realignment to keep the blade life going longer than you might expect. It’s additionally lightweight at only six pounds and is made to be a portable option for moving between locations. On top of that, Porter Cable offers a design that cuts down the feeling of vibrations from the device. This makes it easier to use for extended periods of time. This particular reciprocating saw is made for serious performance and should stand up to home projects, contracting jobs, and professional work on a day to day basis. However, when buying this power tool, you will need to consider whether you own the charger and batteries that work with it. If not, this will add to the initial investment made when purchasing the saw. It does, however, come with a wood cutting blade for immediate use. The speed on this saw maxes out at 3200, which is higher than even some more top-end models on the market. It has a great value for all that it brings to the table and is likely inexpensive enough for even the budget buyer. It also comes with a three-year limited warranty, so you can be sure you will be using it well into the future. The DCS387B from Dewalt is a compact reciprocating saw with a design that places the motor in a diagonal location from the front side of the trigger. It’s quite small with a length that only reaches 14.5 inches. It’s also one of the most lightweight saws on the market and weighs in at 4.9 pounds. The lightness of the design makes it more comfortable to do your work. This is especially true when working on surfaces like scaffolding and ladders. It also has a soft grip handle so grabbing the saw is easy. The handles also give you the precision and control you need while doing your work. The blade clamp on this reciprocating saw has four different positions, which allows for exceptional flush cutting. It also gives the option for toolless blade changing. An additional perk is that the clamp release is on the upper handle outside, so it doesn’t matter where the clamp is when you install a new blade. The four positions available are at 0, 90, 180, and 270 degrees relative to the trigger or handle, which adds to the safety of the saw. As far as the variable speed goes, it can range from zero all the way up to 2900 SPM, which is more than sufficient for cutting through various materials depending on your project needs. The speed trigger also gives you better control of the blade, so you can expect precise cuts. This offers a boost to speed, but also increases the efficiency and versatility of the power tool. One of the other things that this tool brings to the table is an LED light. This is common on other power tools but not seen often on reciprocating saws. The light will ensure you can properly visualize your work area and cut line, regardless of where you are doing work. It does what it is supposed to do to perfection, but the purchase of the tool does require batteries and a charger which bumps the price slightly. This option on our list is different from all the others in a huge way. It is a reciprocating saw that is capable of high performance and efficiency. However, it also is a jigsaw when transformed. The tool is a two-in-one which means that it will take up less space, do more versatile jobs, and offer a fantastic value for someone who is on a budget. It is an excellent choice for a beginner or someone with a home workshop but may not stand up to professional use. Despite having the capabilities of two distinct saws, this tool weighs only a bit over 4.5 pounds. It is well-equipped to assist you with all of your cutting needs. It is cordless and powered by a battery pack. The battery is compatible with other 20-volt Worx tools, so if you already own one, there is no need to invest in another. As a reciprocating saw, it can handle 3000 SPM and has a ¾ inch stroke length. It can also accept both traditional reciprocating saw blades and T-shank jigsaw blades. There is a visible switch on the top or front of the saw, depending on whether it’s in jigsaw or reciprocating mode. Flipping the switch will switch from orbital to reciprocating or vice versa. However, the trigger is a simple on and off switch and has no variable speed. It does incorporate a lock off button, though. The4 motor is on the side which can make the tool a bit wider than expected. However, it adds to the convenience when switching between the tool types. In reciprocating mode, there is an LED light which shines down to offer better visibility. There is also a dust blower, but it is on the base which makes it less useful than a different position might. The tool itself comes complete with the tool, battery back, charger, and saw blades for different cutting requirements. Milwaukee has been putting out various reciprocating saws for their Fuel Line. This one is a true innovator that has pushed past the boundaries of the average saw. As far as the class goes, this 2720-21 M18 is the fastest available. It also can offer up to two hours of runtime for serious projects. On top of that, the tool is expected to last five times longer than the competitors with 30% faster cutting on top of it all. This saw is one of the first to offer a brushless motor, which allows for running cooler and going longer. Another feature that is exciting from the saw is the Redlink Plus Intelligence. This is offered to ensure the tool is always providing the highest performance. It also includes protection from overload through the system communication. It’s impressive to see so many features when considering the small size of the reciprocating saw. It measures only 18 ½ inches in length so it will fit into small and cramped areas without a lot of trouble. This is one of the few reciprocating saws on our list that comes with an LED light for illumination. This adds to the ability to use the power tool in those small areas without a ton of light. Rather than needing extra overhead light or a flashlight, you can just use the light on the tool to make sure you are visually accurate as you cute. This will save you both effort and time when in the middle of a project. This Milwaukee tool also has toolless blade changing technology, so you don’t need to carry around a bunch of tools to make changes when needed. It only takes a few minutes to go from one blade to another, so you can continue your work. It also has an adjustable shoe to ensure the longest life of your blade, and a gear protecting clutch. All in all, it’s hard to find much wrong with this option. The P514 from Ryobi is part of the popular One+ line and offers great flexibility and movement. It comes with the reciprocating saw and three blades, although the battery and charger must be purchased separately. It’s a bit larger than you might expect looking at other options in this range and may require the use of both hands to handle correctly. That can drop the versatility a small amount, but it fully makes up for that with great power of up to 3100 SPM. This means that no matter what you need to cut through, it’s going to handle the job well. The extra blades that come with the reciprocating saw are a nice bonus and add value to the package. These blades are also easy to swap between with the toolless blade change system. All it takes is the touch of a button to switch them out and put in a new, fresh blade. New blades are relatively inexpensive and most find them straightforward to use. This saw also offers an adjustable shoe which can increase the lifespan of your blades by rotating to unused areas and keeping the worn sections away. It also comes with a hex key to install the shoe. This isn’t a tool that is made for a professional, but it does have plenty of power and speed for DIY and home users. It even comes with a two-year warranty, which is reasonable for a budget reciprocating saw as they often do not offer a warranty. For someone who expects to do small or medium sized tasks but won’t be using the saw for hours a day will find that it fits their needs quite well. It has more power than you might expect. It’s a great option for carrying around as needed and weight next to nothing at four pounds. Makita is a brand that is well-known in the power tool arena for offering powerful and high-quality tools. The JR3070CT is a reciprocating saw that is manufactured and designed to handle even the most difficult cutting jobs. It’s capable of demolition work as well as standard cutting. The saw includes anti-vibration technology, so the power and performance don’t lead to hand fatigue. In addition, it has a counterbalance system inside for better efficiency while cutting. The motor on this saw is 15-amp and has electronic speed control. This allows the saw to keep a consistent speed, no matter what is being cut. The stroke on the JR3070CT is 1 ½ inches which allows for faster cutting. It can reach a maximum of 2800 SPM, which is reasonable for cutting all sorts of materials. Controlling the speed is done by use of a variable speed dial. There are six speed presets, so the user can choose the one that best fits their needs. The clutch system is untraditional, as well. The gears of the blade are protected at all times when in use. There is also an orbital action feature with a total of four settings to choose from. You can expect this reciprocating saw so easily cut through wood, drywall, metal, and plaster. It works well when remodeling, doing demolition, or simply working on small projects around the home. It is used by various professionals including general contractors, metal fabricators, builders, roofers, and remodelers who want great power for a decent price. This saw is fairly heavy compared to the others on this list, but it continues to provide power and control. Part of the reason the weight is higher than usual is due to the use of a powerful high-quality blade and a metal case. This is what makes the tool capable of cutting through whatever is needed. For someone who appreciates doing some DIY work from time to time, this Bosch reciprocating saw is an option that will likely check all of the boxes for you. It has excellent handling and the size that allows you to reach small spaces. It can handle cutting wood, but it also has the ability to cut through things like copper and conduit. It even comes with an LED light, so you can illuminate areas that are harder to reach and may not have as much light available. The saw is made to use with a single hand and is light enough for above the head use. Safety and protection are important when purchasing and using any sort of power tool and Bosch has taken that into consideration with this saw. It offers an entire protection system to ensure you are safe at all times during use. It protects against both high temperatures and current overload when you are cutting. It also has toolless blade changes, which can save time when cutting hard materials. There’s no need to drag out a bunch of tools to get things going again. Most people will appreciate the anti-vibration technology associated with this reciprocating saw. It lets you spend as long as you need to work with the device without getting numb or fatigued hands. This is a huge benefit for those who plan to use the saw for long periods of time. Your hands will be safe and experience no tingling. Adding on a pair of gloves will make this feature even better. As far as mid-range reciprocating saws go, the PS60-102 is one of the top choices out there. It stands against the competitors well and can help you cut all sorts of materials. The addition of multiple grip options helps ensure great handling and lack of fatigue while working. It’s also available at a reasonable price and will make a great addition to any workshop or job site. Now that you understand the basics of what makes the best reciprocating saw and know which tools are on our top ten list, you can start to make decisions about which one is best for you to purchase. There are several factors that are important to consider, and we will go over each of them to give you the information you need. Remember to take your time to check out all of your options and get an idea of which fits your needs. This will ensure you get the best saw for your budget and will be happy with the end result. If you are familiar with the blades for a jigsaw, reciprocating blades are similar in that there are tons of different options available to you. If you need to cut through wood, most of them will work just fine. However, there are also blades that are made to get through metal, plastic, brick, and other materials. This is part of what makes a reciprocating saw versatile. You can use it to cut down some branches from a tree one day, then put in a different blade the next for a completely different task. That said, the blades will need to be changed out regularly so choosing a saw with a toolless blade switching system is often a fantastic idea. As a rule of thumb, the quicker cuts are made with longer stroke. In most cases, a reciprocating saw is capable of cutting somewhere from ¾ of an inch to 1 ½ inches for stroke length. Some saws offer only a single stroke length while others are adjustable for more versatility. If you already have a fairly good idea of what types of cuts you will be making, choosing a stroke length that fits that need should be straightforward in most cases. For those who aren’t sure which length to choose, going with something in the middle or selecting an adjustable model is the best option for you. When you take a look at amperage for reciprocating saws, you’ll notice that it varies quite a lot. However, all you really need to know is that the higher the amperage level is, the more powerful you will find the new saw to be. In most cases, the range is somewhere between eight and 15 amps, but there are outliers available. If you plan to do mostly small home projects, 10 amps or so should be reasonable for your needs. Those who are planning to do more frequent work or who will be using a saw in a commercial environment will want to look for the most powerful saws. Consider what performance needs you have and decide on your purchase based on that knowledge. Not every reciprocating saw has the option for adjusting the shoe, but it is a perk when it is available. Essentially, this option gives you a higher degree of control with your projects. You may want to do some research to ensure that the adjustment options work accurately and smoothly. If they do, you will find that you can use multiple positions. It also gives you better functionality without the requirements for buying or using additional tools. You’ll be able to appreciate a better visibility of the blade while cutting in unusual positions. When we talk about strokes per minute, this relates to how fast your reciprocating saw can go. It measures the numbers of strokes done in a minute, which allows you to easily compare various saws. In the majority of cases, saws that are higher amp are also going to have quicker cutting capabilities. As you cut material, when the blade goes faster, that means the cut is going to be better and more precise. You can get work done more speedily while having the best possible control of the blade as it does its work. This is another feature that is present on many reciprocating saws but not on all of them. This isn’t a required feature, but if the option is available, it’s recommended that you go for it. When you have a better control over the speed of your saw, you can manipulate its precision to a much higher degree. Since this type of saw isn’t known for high precision, this can add a layer to its uses. If you are someone who wants a reciprocating saw to use only from time to time, it may not be something you need. However, as you move up in terms of using the saw more often, it becomes more mandatory since it adds to the saw’s flexibility. In many cases, the jobs that require the use of a reciprocating saw are also those that will require you to use the saw for a significant amount of time. Having a reasonable weight and being comfortable are two factors that should always be considered with a new purchase. If you expect to use the saw above your head at any point, this become even more crucial. A reciprocating saw that is too heavy and strain your body as you work. Be honest about your limitations when choosing the weight of your saw to ensure it isn’t too heavy. Saws that are designed to be highly balanced can take some of the weight away from you, but you still want to ensure you are comfortable while working for long periods of time. When choosing a reciprocating saw with a standard saw blade, it is going to move up and down while you are operating it. On the other hand, an orbital version will operate in a shape that is more elliptical. This offers the ability to cut material much more quickly while also more aggressively cutting the project. Some saws have both options, which can go a long way if you are working on various projects of different sizes and scopes. You’ll want to consider what work will be common for you and whether an orbital saw is something you require. We mentioned that there are many different blades for use in a reciprocating saw. There are three types that line up with all of those blades. Some are made for wood, others for metal, and some are hybrid blades intended for use on various materials. Even knowing that, there are other options to consider. Some blades have carbide or diamond chips, some are for more aggressive cutting, and so on. When you are buying blades for your reciprocating saw, you want to be sure you choose a product from a well-known manufacturer. Every company that makes power tools will also produce their own blades. Some individuals are going to find a certain blade most efficient and useful for their personal needs, so don’t be afraid to do some experimentation. It isn’t required to choose an auto-stop brush, but when you do, you can expect for it to make your reciprocating saw last longer. It will also offer an extra layer of safety when in use. As soon as you shut off the power, these brushes cause the blade to stop moving immediately. This means you aren’t going to end up accidentally brushing over a blade with your fingers after switching off the tool. In addition to that, when the brushes finally wear out, this will also stop the saw from moving. This helps to prevent any potential damage to your saw’s motor. It may not be required but it is a great feature to watch for. Since a reciprocating saw moves back and forth quite quickly, it’s no surprise that there can be some vibration when using one. Pushing the shoe against the material can help with this, as can ensuring you have excellent control of the saw in your hand. However, that won’t remove all vibration and over time you may experience fatigue or numbness. This is why many manufacturers are now offering features to drop the vibration level further. This might be offered through something as simple as separating the handle from the body of the saw. In other cases, it may involve counterbalancing weights inside of the tool’s body. There are both corded power saws that plug into the wall and cordless saws which typically make use of a lithium-ion battery. The batteries for different devices can range in voltage level from 12 to 20 and 28 to 36. Sometimes this is just a means of marketing, but it can also give an idea of how well the reciprocating saw will perform. However, this isn’t the entire story either. What you need to know is the watt hours, which is a common way to review power among various batteries. If you can’t find information about the watt hours, all you need to do is take the amp hours and multiply them by the nominal voltage. Then you can compare batteries to get an idea of the power you can expect. If you choose a corded model, a detachable cord is typically the best option available. One of the unique accessories available for this type of saw is a pipe clamp, for doing jobs without clamps, and limiting chocks. In addition, those who do gardening or landscaping may benefit from purchasing specialized bumpers that attach onto a branch for easy trimming and others work. When it comes to required accessories, having replacement blades is a must. Some saws will come with a few extra, but for others, you may want to purchase a few at the same time as buying the saw itself. While the features we have mentioned so far are some of the most important to think about, there are a few other things that you may want to at least be aware of. For instance, some tools come complete with a storage case which might be useful if you plan to store or transport the saw on a regular basis. The material used for the housing of the reciprocating saw can also be important if you are doing medium or heavy-duty work. A housing made of metal is going to offer the most protection for your motor which will extend the durability of the tool. It can also help prevent the motor from burning out during extended heavy-duty use. You may also want to think about whether the saw has speed regulation. This helps the saw stay at a specific speed the entire time it is in use. It can speed up your work and help you get through more dense materials. At this point you have information on our top 10 favorite reciprocating saws, along with the pros and cons of each. We’ve given you some information on the basics of these saws, along with the things to look at when purchasing a new reciprocating saw. You should be well-equipped to determine what your options are and choose the saw that best fits your need. Don’t be afraid to take your time and look through additional reviews to ensure your purchase is right for you. There are plenty of excellent options and you’re sure to find the saw that fits your unique needs. Go over your options, consider the factors that matter most to the work you do, and compare them against each other. Good luck out there!